PLEASE don't ask for MAPs in this thread. Make a new post in the forum asking for a MAP and then if someone has a MAP they will post it in this thread or I will copy it over. That way we can keep this as clean as possible. Just MAPs and information. Hey guys' date=' I have a suggestion. MSQ files are specific to the firmware you're running, so it is REALLY helpful to post screenshots or at least exported tables (*.vex) as well. I assume what most of us really want to check out is the VE and spark tables. Hello Everyone, it's been a while since I have posted on here. The majority of my recent questions have pertained to MS and I have lounged around on http://www.msefi.com for the past few months. Anyway...to give an update, I have MSnS (standard, not 'extra') running on the '77. I have spent the past few days attempting to tune spark and fuel, but haven't been nearly as successful as I was when I ran fuel only. So, with that being said, I would like to encourage everyone to collaborate and post your setup and your maps. I think it would be beneficial, especially for me! Moby has done an excellent job organizing MS information for all us to use, I don't believe we thank him enough! Thanks Moby! Here is my .MSQ (very rough tune, so beware!!!). I'll post my ignition table later. So, what is your setup and post your .MSQ. If you need webspace, just email the file to me and I will host it for you! Just wanted to post a quick followup and renew everyones interest. I have continued to run MSnS standard and do further tuning, but have had issue with decel enrichment and having the cab filled with gas fumes when I downshift to slow down. Pulling 20inhg of vacuum at idle and ~12inhg when cruising, I am needing the 12x12 tables to densify my KPA values. Additionally, I have a friend who will be meeting up with me to tune with a WB as the one-wire NB I am running is performing poorly, even for NB expectations! So...with all of that said, I am loading a version (which?) of 'extra', turn up the boost to ~15psi (T3), and we are going to tune with the WB. I just don't feel comfortable providing my .MSQ right now as I don't believe it is beneficial to anyone in the current state. EDIT: Here are my maps as of 04-03-05. The car is still running rich on the boost side, but again, no WB so I am not taking risks. We should also start a discussion on how we tuned, etc. and what sort of logic. You know, share the secrets to success, cause I dont' have them! When I get back from business trip, I am gonna move over to 'extra' and probably go get some dyno time. I just don't feel comfortable providing my .MSQ right now as I don't believe it is beneficial to anyone in the current state. That's The problem with a lot of us megasquirters. There is always room for improvement. So no one is willing to post there settings. And I feel the same way. It's crazy but I feel like showing your maps is like showing something really personal. Because I am stil improving and working on them. But I will probably never be finished tweeking the tables. So I'm gonna get over it and post my maps anyway. people can learn from bad maps aswell. This is the map that I have been running with my HIGH compression turbo. I destroyed 2 (cheapo) headgaskets with these settings. So I don't advice anyone to copy them. EDIT: I can't attache .msq file so here is a link instead. Since I have made changes to my setup, I thought I would post my .MSQ and an interstate datalog. 1. Added boost controller and upped initial setting of 13psi to 15psi. I used the 'Boost Duty Targets' table to accomplish this as the 'Boost KPA targets table1' setting did not work out for me. 2. Setup up 'Over Run Settings'. I initially thought this was for something else, but realized it is for fuel cut during decel and engine braking. 3. 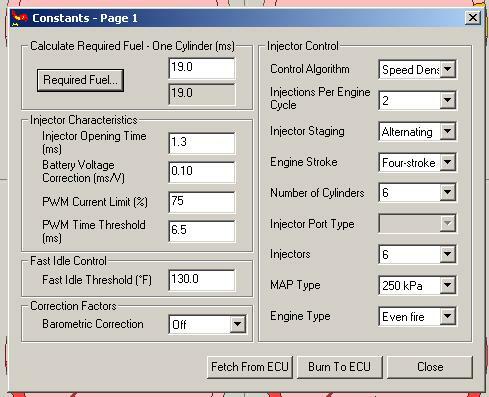 Made adjustments to the lower kpa/rpm area of my fuel table to compensate for adding 'Over Run Settings'. 4. Setup 'Overboost Protection'. I haven't found a real good setting for this, but have it setup to cut 2 out of 5 sparks. I did not set it up to cut fuel, for some reason I just don't feel this is safe for the engine. Any more than 2 out of 5 sparks is VIOLENT on the drivetrain. As far as cutting spark blowing up my muffler or exhaust, well, I don't really have an exhaust, unless you count a 3" crush bent peice of open exhaust from the turbo exiting the rear. 5. 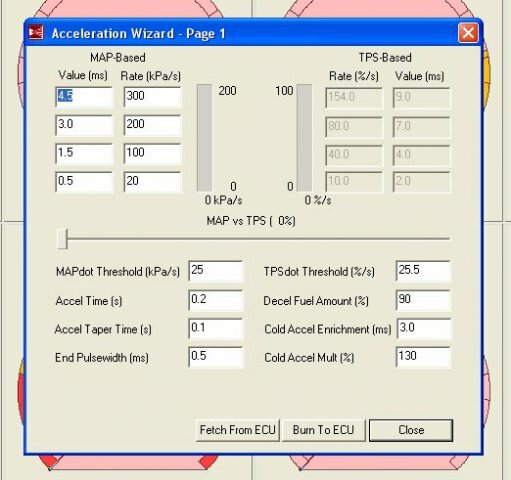 Set my accel enrichment to TPSdot. MAPdot was difficult for me to tune against. I have more tuning yet to do. My goal now is to setup a target AFR table (on paper, not in MS) and tune again. Gonna up boost to possibly 18psi (yeah, on stock T3!) and tune for 11.5:1 AFR. That is if my intake temps will stay down. I made a couple of runs at the dragstrip Sunday (one run netted 13.1@107) and my IAT hit a max of 120F. EDIT: Just reviewed .XLS closer and I hit a max of 120F (actually from heatsoak) and an average of 103F. It's currently 83F and 43% humidity here in Alabaster, AL. What adjustments did you do after setting up over-run? I didn't have to do any. Your car is intercooled right? My IAT has hit almost 200 deg F.
The over-run was actually easy to set. I thought it would take some tweaking, but found the initial setting was good enough. My only thing is the rpm activation. With light driving, I like it set low (1400 rpm), but with more aggressive driving, I like it set a little higher. As far as intercooler, I am running an 18"x8"x3" Spearco with 2.5" inlets. I went a little overkill, but it works great! 200 F is high. I don't know the limit, but that would scare me! Even a smaller intercooler off of a stock DSM or similar would help tremendously. I finally got the information to fix the links on this post, but it seems that its harder host files now than it was in 2006..
running msns-extra.s19, 024s13c. on a V3 board. This is my current settings-file, of course I am continually tuning, but after 4 days of running, it is running pretty good. 280ZX N/A distributor, no mechanical advance. Let me know if I need to add any more info. Hey guys, I have a suggestion. MSQ files are specific to the firmware you're running, so it is REALLY helpful to post screenshots or at least exported tables (*.vex) as well. I assume what most of us really want to check out is the VE and spark tables. I hope to fire up the car tomorrow, so I'll post my MSQ then. I just spent about 30 minutes converting my old 8x8 spark table to 12x12 so I can post that. Not sure if it's optimal or anything though. Ill have to post up my .msq when I get a chance, but I can tell you this to make the spark part a little less painful, at first. anyways.... I just made my table like a standard non vac dist. started at 10* at idle and ramped it up to 35* by about 3,000 rpm and planed it out after that. all up and down the KPA range. I add little bumps here and there for cruising and what not and take a few degrees out here and there when it pings, but basically, this made it run stable to get the fuel figured out. running coil control through the fidle (I fried my VB921 with a 75% duty cycle, oops) I am using a VG30E ignitor to fire teh coil and running dwell control. stock NA injectors for now, upgrading to turbo units soon. These are my settings... N/A fuel only. email me for msq as i can't host it right now. this plot worked pretty good until my cam started to kick in... then it would die on its face. These are very rough... but i've had alot of request for them. I never got them perfected and i never tuned with an 02. I'm sure the maps are rich judging by my fuel gauge. !! !GO TO NEXT POST FOR MY LATEST MSQ FILE!!! Stock ZXT Idle air controller. NOTE: This is seat of the pants tuned! ! !DO NOT TRUST THIS WITH YOUR MOTOR AT FULL TILT!! Running very well. No surge, AFR's from 11.5-15.0, good power all over, good mid end torque, very smooth down in the low RPM's. This was tuned using several iterations of AutoTune, VE Analyzer in MegaLogViewer, and manual map smoothing. I increased the ranges of the kPa from 20 to 220 on all maps and datalog-street-tuned it to 10psi@6000rpms. The max boost achieved during the drive-tune was 15psi. NOTE: I cannot safely gaurantee that this is good for more than 15psi and 4500 RPM. Timing map is very aggressive and I am not going to push it any further without a dyno and knock sensor. It is NOT a dyno tune, it is a street/driveability tune and runs very well. Here is the msq 7/12/07. My specs are in the post above this one. Here is my MS setup file. Engine is pulling like train from low down all the way to max rpm. It's so powerful most of the time I only need 60% throttle to scare myself! 3" IC pipe work . 3" stainless exhaust, single straight thru back box. For ignition I am using a VB921 coil driver setup to the first LED on the V2.2 Board. attached are the files in zip format, including the exported tables. I cant edit my previous posts so I had to put the latest msq file here. If I understand correctly, for EDIS it is now realized that Ignition Input Capture should be changed to 'Rising Edge'. Your map posted a few months ago doesn't reflect that and I'd suggest anyone considering using your map as a basis should look into that. Very true Wizzard black, It's now been changed along with fuel and timing for a much better msq. How do I delete the existing one? Yoyoyo, finally got my tuning polished up enough that I think I can post it up. Bone stock n47 L28. Yeah baby. MS1 with 2.2 board running fuel only. Mine? Stock: injectors, everything... Think they are 195cc..? Oh and 240sx TPS, think thats the same as the ZX. I want to confirm for anyone wondering, I plugged Gavin's numbers into a stock 280Z that we are prepping for the 24 Hours of Lemons at Thunderhill the end of this month, and the car fired and ran well. Burned 'em leaving the line and good scratch in second gear as well! So for an 'out of the box I HAVE to drive this RIGHT NOW' plug-and-play 8X8 set of N/A tables I will say they worked. My differences (which attest to Gavin's Map) I have O2 correction disabled, so it's running ONLY on his map. My Req Fuel is something like 18.6 or thereabouts, only because I used 170CC injectors (which I thought were stock), this should be of no consequence. WE currently have the accel bins and cold start enrichment 'off' for all intents and purposes because we wanted to test his MAP, and not how well anyting was masked. I will post back as we install the rest of this supplementary enrichments on his original post, but I know there are people looking for 'confirmation' that one set of tables works well or not. I say Gavin's is a great table for someone who needs to drive the car right after installation. Chances are good we will be runnning his fueling table for the race, unaltered. I just got it to a nice 12.0:1 afr line under boost from onset of full boost (~3000rpm) all the way to redline (7000rpm). It's also tuned to 15.5:1 at 75mph (2800rpm and 55kpa on my car), low 15's from 55mph to 80mph, low 13's at super high vacuum (engine braking), low 12's at idle (it's the only way it likes it), and low 14's around town, though I'm still working on those a little. The 40's at the bottom of the map have just been left there because they're below my minimum injector on time anyways, so it's just 1.1ms squirts no matter what. Currently running 12psi max with no known detonation. Plugs look okay and the exhaust is very quiet....so hopefully I would hear pinging. No guarantee but worth a shot. My best throttle response comes from a mix of x tau and traditonal accell bins used in this file. Working on an all x tau msq but its just not as good as this one yet. For anyone looking at possibly using 2.88 code...it was a big improvement for me with regards to mapdot and throttle response. I could probably run it as low as 35 for map and 10 for tps but I can't feel the difference over more conservative numbers of 50 and 15 respectively.